This base turns your BYB E4 series (E476 and E433) clip-on lamp into a table lamp, ideal for use on a table or flat surface. 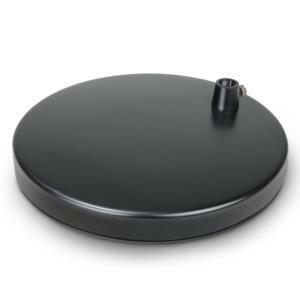 This base is weighted (5.5lb/2.5kg) to improve stability of BYB lamps; painted matte finish to match the lamp; features non-scratch/non-slip feet and measures 7.8in/20cm in diameter. When will this be in stock? The lamp base is available now. Any issue you can feel free to contact us via Amazon message. Sorry for late reply. Somehow this question didn't show up. This base is perfect. Nice weight to it so the lamp won't fall over. I originally had the light mounted to the edge of the desk, but after moving the desk close to the wall this made more sense. Nice brushed aluminum matches perfectly with my Apple Macbook Pro and 27" inch Apple monitor. 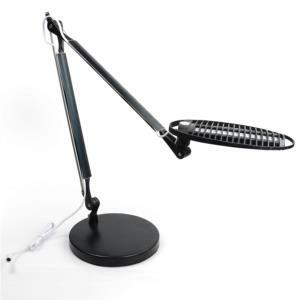 This is a perfect companion to the BYB E430 Metal Architect Swing Arm Desk Lamp. Because my drafting table is very large, I found clamping the lamp to the table edge a bit limiting. With the base, I can position the lamp and direct the light where I want it. Works well, even with the slightly slanted surface. Perfect. Well made , heavy and works well. Have an odd table that does not have a lip for the standard lamp mount, this solved the problem and is better because we can now move the lamp around the craft table where needed. Nice weighed base. Very happy with it. Great product. It works perfectly on desk. High;y recommended. BYB's staff was very helpful. I needed this base because my desk is not fit for the clamp. I emailed them, and they responded very quickly when the item was out of stock. The cushion on the bottom was wrinkled a bit, but it was not a big deal. I fixed it. © 2018 BYBLIGHT. All Rights Reserved.